Just itching to set up a compost bin in your backyard? Here's an easy how-to that relies on shipping pallets and some clever ingenuity. A compost bin is a great way to keep waste material out of landfills while at the same time creating wonderfully nutritious soil for your garden and houseplants. There are a wide variety of compost bins available for purchase, but they are not cheap, and most of them are made of plastic. They aren’t terribly attractive, either. 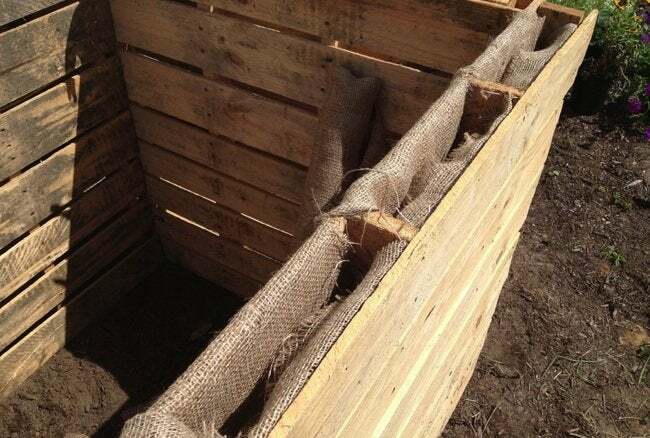 If you’d like to take recycling and Earth renewal one step further, you can build your own compost bin very inexpensively by repurposing shipping pallets. And with only a little bit of extra effort, you can make it serve as a planter as well, so it’s not an eyesore in your yard. A project like this requires a bit of dexterity, so it’s important to have tools and hardware at the ready. That’s why my Dickies carpenter pants have become my favorite “work out” gear; they keep hammer, screwdriver, scissors, and more within easy reach at all times. They’re a much more comfortable and practical alternative to the traditional tool belt. Find a suitable area on your property for your bin. You need an approximately 4′ x 4′ space for the bin as well as some clearance on one side so the door can swing open. Clear the area of all grass and plantings and make sure it’s level. Ideally, a compost bin needs to have sun to warm it, and a water source close by. Pick your location with these requirements in mind. Give your pallets a good scrub down with some mild soapy water and then rinse them. Examine them and make note of any loose, cracked, or broken boards. Decide accordingly which sides should face out, and in which direction. Dry fit them together to make sure you like the way they look. Connect two pallets together from the inside with two to three L-brackets, forming a 90-degree angle. Connect a third pallet in the same way to form a three-sided box. Connect the fourth pallet to the front of that three-sided box with two to three hinges to create a door that swings open. This will allow you easier access to your compost to turn it and to remove it when it’s ready for use in your garden. Depending on the construction of your pallets and the length of your screws, you may need to set the screws on the side of the hinges at a slight angle, so that they don’t impede the opening of the door. TIP: If you want to pretty it up, you can stain your bin and plant the top with a mixture of perennials and annuals. Apply an outdoor stain in the color of your choice to only the exterior boards of your bin. Keep the interior of the bin free of stain, as you don’t want any of the chemicals in the stain to be in contact with your compost. 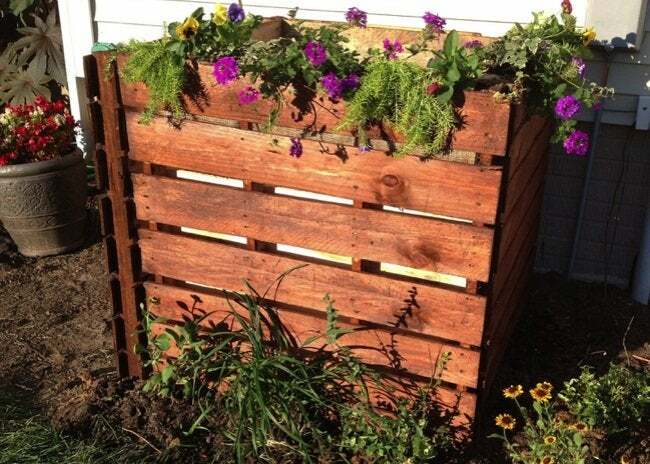 For each side of the bin you want to put plants on, cut a piece of burlap or landscaping fabric to the length of the pallet with approximately 1 foot of the cloth hanging over each side of the pallet wall. Cut a notch in the fabric at each brace point on the pallet. 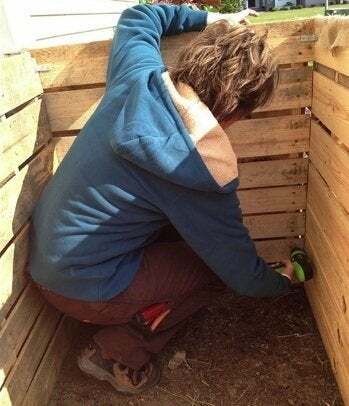 Slide the fabric down inside the wall of the pallet to create a pocket that will hold the soil and plants. Staple the burlap or fabric to the inside of the interior pallet wall and the inside top of the exterior pallet wall. Hammer in any staples that aren’t flush to the wood, and trim the excess burlap or fabric with a pair of scissors. Plant a variety of vining or creeping perennials alongside some pretty annuals. Fill in with extra potting soil as needed. Water thoroughly and continue to water well until your plants are established. 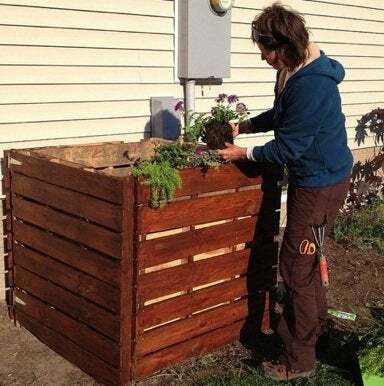 You may opt to put some plantings around the exterior base of your bin as well. Something evergreen will give it attractive cover all year long. Now you’re ready to compost! Start to fill your bin with a mixture of compostable materials like sticks, grass, raked leaves, sawdust, and cuttings from the garden. Make sure to water it and keep it moist, and turn it at least once every week. In 6 to 12 months, you’ll have “black gold” to feed your garden, landscaping, and houseplants. Happy composting, everyone!